During the final seconds prior to the planned launch of the Space Technology 5 mission on March 15, a retention pin that holds the starboard-side fin aerosurface on the Pegasus rocket first stage did not retract. That forced the launch team to call an abort. This movie shows the scrub as it happened. Fuk Li, Mars program manager at JPL, Jim Graf, MRO project manager, Rich Zurek, MRO project scientist, and Dan McCleese, the principal investigator for the Mars Climate Sounder instrument, provide an overview on the Mars Reconnaissance Orbiter on March 8, about 48 hours before arrival at Mars. Spacelab was an orbiting laboratory tucked in the payload bay of the space shuttle for scientists to conduct a range of experiments. The joint European/NASA program flew multiple times aboard shuttle missions starting with STS-9 in November 1983. In this post-flight film presentation, the astronauts from that Columbia mission narrate the highlights from Spacelab-1. Astronomers report an unprecedented elongated double helix nebula near the center of our Milky Way galaxy, using observations from NASA's Spitzer Space Telescope. The part of the nebula the astronomers observed stretches 80 light years in length. The research is published March 16 in the journal Nature. "We see two intertwining strands wrapped around each other as in a DNA molecule," said Mark Morris, a UCLA professor of physics and astronomy, and lead author. "Nobody has ever seen anything like that before in the cosmic realm. Most nebulae are either spiral galaxies full of stars or formless amorphous conglomerations of dust and gas - space weather. What we see indicates a high degree of order." 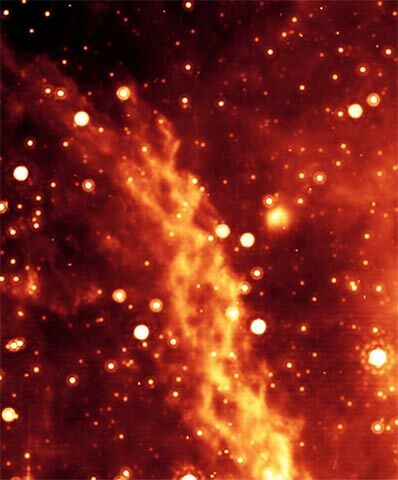 The Spitzer Space Telescope, an infrared telescope, is imaging the sky at unprecedented sensitivity and resolution; Spitzer's sensitivity and spatial resolution were required to see the double helix nebula clearly. Offering another analogy, he said the wave is like what you see if you take a long loose rope attached at its far end, throw a loop, and watch the loop travel down the rope. "That's what is being sent down the magnetic field lines of our galaxy," Morris said. "We see this twisting torsional wave propagating out. We don't see it move because it takes 100,000 years to move from where we think it was launched to where we now see it, but it's moving fast - about 1,000 kilometers per second - because the magnetic field is so strong at the galactic center - about 1,000 times stronger than where we are in the galaxy's suburbs." A strong, large-scale magnetic field can affect the galactic orbits of molecular clouds by exerting a drag on them. It can inhibit star formation, and can guide a wind of cosmic rays away from the central region; understanding this strong magnetic field is important for understanding quasars and violent phenomena in a galactic nucleus. Morris will continue to probe the magnetic field at the galactic center in future research. This magnetic field is strong enough to cause activity that does not occur elsewhere in the galaxy; the magnetic energy near the galactic center is capable of altering the activity of our galactic nucleus and by analogy the nuclei of many galaxies, including quasars, which are among the most luminous objects in the universe. All galaxies that have a well-concentrated galactic center may also have a strong magnetic field at their center, Morris said, but so far, ours is the only galaxy where the view is good enough to study it. Morris has argued for many years that the magnetic field at the galactic center is extremely strong; the research published in Nature strongly supports that view. Co-authors on the Nature paper are Keven Uchida, a former UCLA graduate student and former member of Cornell University's Center for Radiophysics and Space Research; and Tuan Do, a UCLA astronomy graduate student. Morris and his UCLA colleagues study the galactic center at all wavelengths. NASA's Jet Propulsion Laboratory in Pasadena, Calif., manages the Spitzer Space Telescope mission for the agency's Science Mission Directorate. Science operations are conducted at the Spitzer Science Center at the California Institute of Technology. JPL is a division of Caltech. NASA funded the research.